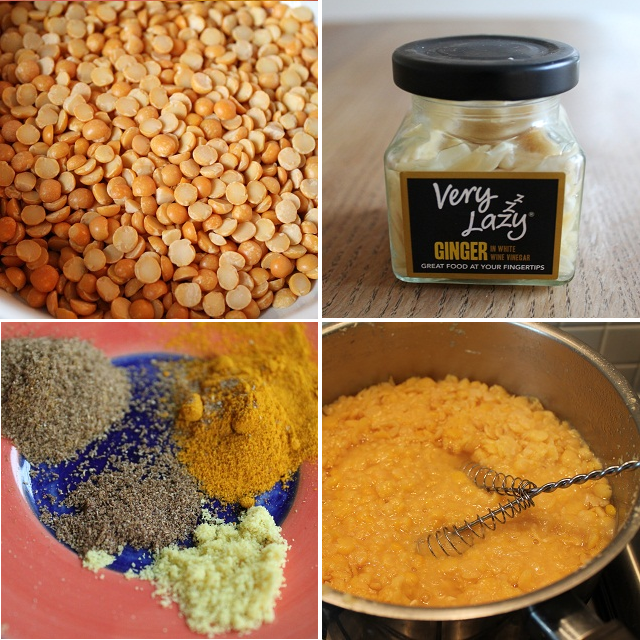 Here is my recipe for tarka dhal - requested by Saving For Travel. I enjoy Indian side dishes even more than main courses but have always bought them as ready meals before. Tarka dhal is quite cheap as a ready meal but even cheaper if you make it yourself (and makes about 4 times the quantity). If you have the spices in your stock cupboard then this is an incredibly cheap and nutritious meal - you'd be daft not to have a go at cooking it yourself. So here's my tarka dhal. Creamy, comforting - a cheap and nutritious meal to revel in. I hope you enjoy it. Rinse the split peas in running cold water (no need to pre-soak). In a pan add the peas to the water and bring to the boil. As the water boils, skim off the froth that forms. Reduce the heat, add a lid to the pan and simmer the lentils for approximately 35 minutes or until the peas are mushy and nearly all the water has been absorbed. Once cooked mash the lentils with a fork or whisk and set aside. Meanwhile, heat the oil and add the cumin seeds for a few seconds until they sizzle and release their wonderful aroma. Add the onion, ginger and chilli flakes and cook until the onions begin to brown. Pour in the chopped tomatoes and add the remaining spices. Cook for 10-15 minutes and then add the cooked lentils. Add extra water if the mixture becomes too thick or begins to stick (a loose consistency is ideal as this dish thickens quickly once cooked). For extra pizzazz stir through chopped coriander and a good squeeze of lemon juice. Serves 4 as a main dish. Eat with bread, rice and salad or as a side dish with other curries. Fresh chopped tomatoes, ginger and chilli (red look wonderful against the golden dhal) can be used, but will add to the preparation time. Other spices such as cardamon pods, cloves and asafoetida can be used in addition to ring the changes. I have omitted garlic as a personal preference (because there are so many layers of flavour I don't think this dish needs a garlic kick). Chilli powder could also be used instead of chilli flakes or in addition. Thanks for this. Definitely going to try it. Tandoori chicken is a favourite but can be dry on its own so this would be perfect. Presume it would be ok to substitute ground cumin for cumin seeds? I will be having this for dinner next week, perhaps with some flat bread to mop it up. No meat though but a bowl of salad leaves. We love dhal and your recipe looks very like the dhal served at a local cafe some I will be trying out next week too! I forgot to say that I freeze ginger and then grate it from frozen. That sounds and looks really good, just the kind of thing I like. My neighbours preserve their ginger in a jar full of sherry! I must try this recipe. Mmm, this looks delicious. I'm hungry now. Oh yum. I haven't made this for ages, I must make it again. We love it with naan bread or chapattis.